Trail’s End Lodge combines the perfect balance of rustic mountain elegance and unparalleled service with the comforts of home. The lodge's convenient ski-in/ski-out location on Success ski run allows guests to enjoy world-class skiing directly from their accommodations. Accommodations range from one to four bedroom residences and feature upscale kitchens, comfortable living areas, floor to ceiling stone fireplaces and private outdoor hot tubs where you can relax after a long day on the slopes. In the winter months, join us in the Aspen Room for a freshly prepared complimentary full breakfast and après-ski including a variety of snacks and drinks for all ages. Allow us to customize your vacation experience with personalized service by arranging anything from activities and dining reservations to stocking your refrigerator with your favorite treats. Soothe your tired muscles with a massage; Trail's End Lodge offers two dedicated massage rooms. Relax in the outdoor heated salt water swimming pool or unwind in the steam room. Whether it is your first visit to Trail’s End Lodge or you have stayed before, the staff eagerly awaits each guest’s arrival! 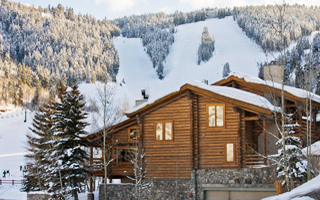 Condominiums feature ski-in/ski-out access, a full kitchen, spacious living area, fireplace, washer and dryer, private hot tub and are located adjacent to Deer Valley Resort's Snow Park Lodge.